Additional notes: This is the third book in the Whispers on the Moors series. You can read my review of the first book here and the second book here. My thoughts: There is nothing more satisfying in a book than real characters and a real plot. I loved how relatable the characters' problems were - they weren't just superficial issues. For this time period, and for conservative people in this time period, they are real issues. I have to admit I was a bit sad the story ended how and when it did; just when Cecily gets what she wants (which is not just the boy), the story ends. I wanted to know more about what happens next. The ending was bittersweet for me. 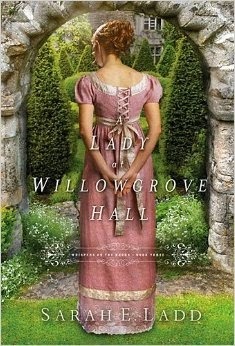 I was also hoping that somehow Willowgrove would come to someone other than who it did. I felt sure Mrs. Trent would change that, but it appears that is not to be the case. If nothing else, all of my disappointments just prove how invested I was in the book and the characters. If you're a fan of historical fiction, you'll enjoy this series.